In this section, I will show you how to play with seven bows all at once! – two in each hand, one in your elbow, one up each nostril, and some coming out of your ears too! Well, no, I’m only kidding. About the closest I could come to that would be to play with one bow, and sit on the other six. I should start off by saying quite plainly that playing is not my strong point. I enjoy playing the bowed psaltery and I mainly play simple melodies for personal enjoyment. I’m certainly no musician, I consider myself mostly just a builder – and appreciator – of bowed psalteries. This section is meant only to give a very basic and rudimentary overview of playing mechanics. Advanced playing techniques – such as using multiple bows – I’m afraid, are mostly beyond me. (I do use two on occasion, but that’s my max.) So, with that brief disclaimer, I will now start my humble section on playing the bowed psaltery. Maybe you have been looking at pictures of the bowed psaltery – with its many strings – and you are wondering exactly how you play this peculiar instrument – or bow it for that matter! I think you’ll be surprised to see that it is much simpler than you may think. 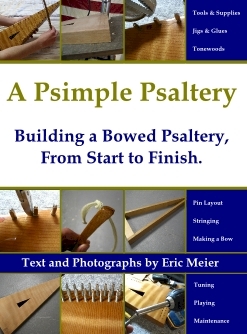 The above picture should clear up most of the confusion for anyone who has not played a bowed psaltery yet. The strings are bowed along the sides of the instrument, not the middle. 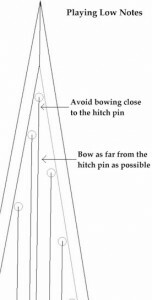 The bow is run in between the pins on the right and left sides of the instrument, where there is an opening and only one string can be bowed at a time. Sharps and flats are played by reaching the bow over to the left side of the instrument. The most common way practiced is to hold the tip of the psaltery out away from your body with your left hand holding it about two thirds the way up. Then, nestle the base of the instrument either on the inside of your elbow, or against your abdomen. The right hand holds the bow and does all of the playing. A variation on this is to just sit down and set it on your lap, loosely supporting the end with your left hand. 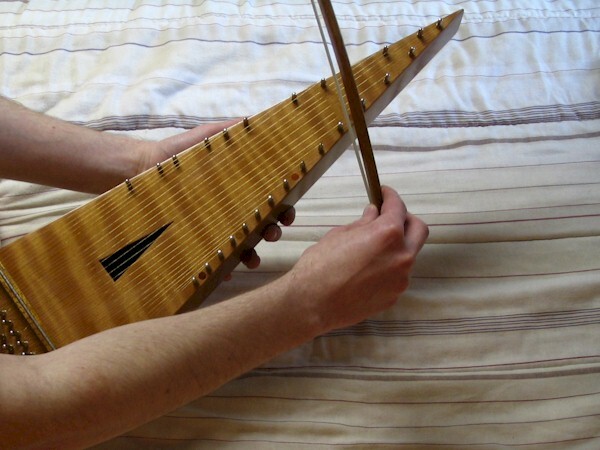 Experiment to find which position you are most comfortable with in both holding and playing the psaltery. 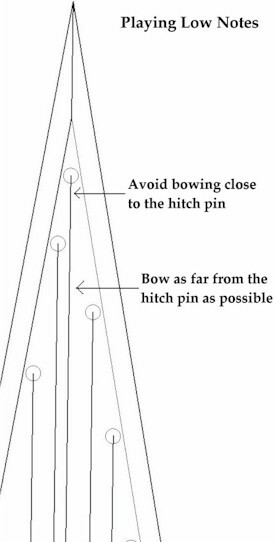 Now, with a light grip, run the bow along some of the strings in between the hitch pins. If you have applied enough rosin to the bow, your psaltery should give a nice sound as you run the bow across the strings. Try to keep the bow moving even after you have let it off the string. This is to ensure that you don’t accidentally stop the bow before you lift it off the string. If this happens, the sound of the string will come to an abrupt stop and sound a bit awkward. You are after smooth, fluid arm movements. Practice moving up and down the right-hand side of the psaltery, playing each note as you go. You may even be able to play a song by ear. Next, practice reaching over to the left side and angling the bow to play all of the notes on the left-hand side. With a little bit of practice, you should be able to get some nice sounds out of it in a very short time. However, dont be discouraged if you also create some horrendous squeals from the psaltery on your first time. Like anything, it does take some practice, and many mistakes may simply be due to very slight problems in technique. Let’s hear our project psaltery play all the naturals on the right-hand side, from G4 up to G6. You probably can’t tell from that clip, but this psaltery sounds fantastic. I played it alongside other psalteries, and the tone on this one is really deep and full. I have a technique where I hold the back of the psaltery up to my ear and pluck the longest string to see how well I can hear it through the frame and back. This one’s really a winner! The string may be out of tune. The string may need to develop a light covering of rosin. If you continue to play the instrument, you may notice a subtle buildup of residue on the strings. I have found that a moderate amount of rosin can help the strings play more evenly. The string may have built up too much rosin. Just as in the previous example of not having enough rosin, the converse can also be true. If a string sounds funny or off, and it has an excessive amount of rosin built up on the surface, you may need to wipe it clean with either a dry cloth, or in extreme cases, a cloth lightly dampened with rubbing alcohol. (Alcohol is capable of marring some wood finishes, so use care.) In the future, use less rosin on the bow. Try adjusting the angle that you hold the bow. Tip it almost flat on top of the psaltery, or try it more vertically and experiment with different angles and techniques. You may be using too little or too much pressure on the strings. As a general rule, the lower-pitched strings sound best with more pressure from the bow, and the higher-pitched strings need less pressure. To use the correct amount of pressure, practice by playing the higher-pitched strings with the far end of the bow for lighter pressure, and the lower-pitched notes with the base end or heel of the bow to create more pressure. If you have a violin bow, adjusting to a higher hair tension can help you get more pressure too. Once you seem to be getting consistently good sounds from your psaltery, and have become familiar with all the notes, (this is where you will realize how helpful those note markers we put in really are), and all the ins and outs, it’s time to finally make some music. This, of course, means that we should play a song! Playing songs can be done any number of ways, depending on how “music literate” you are. If you can read sheet music, you should have no trouble playing just about anything you can get your hands on. For hymns, there is The Cyber Hymnal. To view most hymns as sheet music, you will also need to download a free viewer program from Noteworthy Software. For classical music, there is the International Music Score Library Project. Beyond sheet music, there are all sorts of alternative music-learning programs. (Tabs, learn-by-number, learn-by-letter, etc.) I think that each person may have their own personal learning style; and while one person may say, “it worked for me!” another may learn music in a completely different way. Some people just play songs by ear. Chances are, if you know a tune very well, you can probably figure it out on the bowed psaltery simply by trial and error. That song was of course just a small sampling of all the different things that you can do with your new bowed psaltery! I really have no formal music training, and I’m sure that that song wasn’t technically perfect, but I hope you get the idea. Gosh, it feels so strange to be done. That’s it! We’re done with our bowed psaltery project. I hope you enjoy your new instrument. And it is useful to remember that the bowed psaltery is a musical instrument. You have not made piles of sawdust and wood shavings, and spent hours of finishing and stringing simply to have a decorative triangular box. Within this “box” is a song that is waiting to burst out into the air at your fingertips, all you have to do is pick up the bow and practice. Remember to put the bowed in bowed psaltery. Of course, it would only be fitting to leave with a song too. Here is, (what else?) the song Simple Gifts. A Psimple Psaltery receives a small commission on sales generated through links to eBay and Amazon.